Steve Cameron: Science Fiction & Fantasy Author: We Don't All Wear Funny Costumes, You Know. About 6 months ago I discovered the Melbourne Science Fiction Club. One Saturday I headed down to an MSFC mini-convention that I'd read about online. I had an absolutely marvelous time and joined up on the spot. Since then I've attended a few meetings, gotten to know a few people and learned a bit about 'our' history. Last Friday was special, an evening I won't forget in a hurry. Murray, our extremely capable President, did a fantastic job of installing Helena and Jocko as Life Members. Not only was it fascinating to hear their stories of how they became involved in the club, it was great to hear the tale of how the club started. The second longest running SF club in the world, MSFC has been running since 1952. 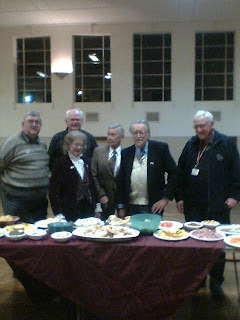 (The longest running is in L.A. - started in the 1930s) On hand for Friday's presentation were most of the serving Life Members, including some of the founders. And besides learning about some of the crazy things that have occurred over the years (a teddy bear shaped hole in a window, indeed!) I was able to meet some very cool people, including Ditmar. I've already cleared the spot above my desk where the award that's named after him will one day sit. In the past few months I've had a few moments of disillusionment with certain aspects of SF publishing, about my writing and with parts of fandom. But along with Continuum 5, the MSFC has restored my faith in the future of SF. Thanks guys, and thanks especially to those who decided in 1952 that their regular social gathering needed some formalisation.